Malacca (locally known as Melaka) is well known for many Peranakan cuisine. During the “A Date with Bloggers in Melaka 2012” event organized by 1asiafoodguide.com and bestmelakaguide.com recently, a few of us managed to squeeze out some time to explore some of the nice cuisine outlets surrounding the Jonker Walk area. 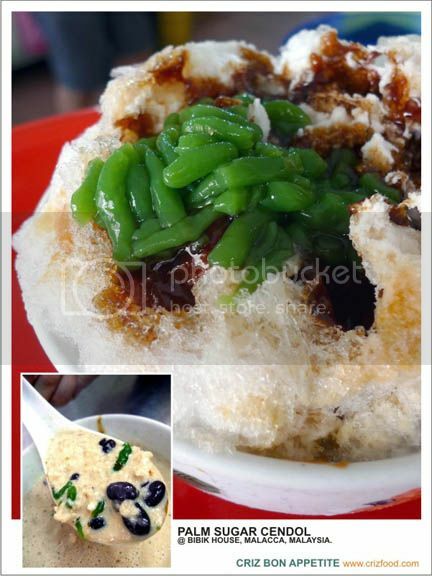 One of the most loved items was the Malacca Cendol. Compared to the Penang version which would use brown sugar, Malacca Cendol would use their famed local product – the Gula Melaka, a palm sugar which has a unique thick, rich, aromatic and natural sweetness. 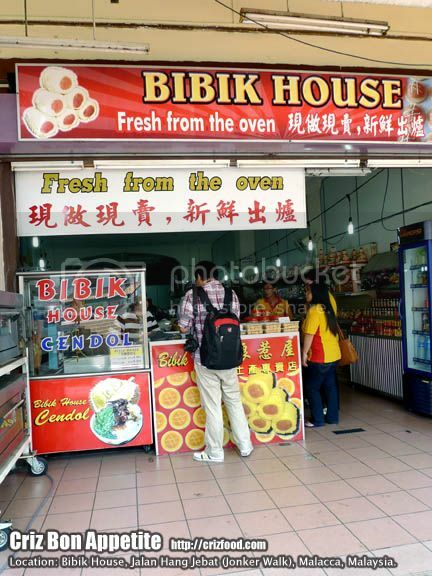 As we approached Bibik House, the buttery aroma coming from their daily baked pineapple tarts drew our attentions but that was not our target as we had quite many earlier on. What attracted us was the signage showing the Bibik House Cendol with durian. It would be great to try them out to compare with what we have in Penang. As the weather in Malacca was crazily hot on that day, we had decided to try out just the plain Cendol (RM4.00nett) instead of the Durian Cendol (RM5.00nett) which would only come with an additional topping of a caramel-like durian paste. Having durians in the system on a humid day with lack of rest would surely be seeking for trouble to be down with illness, right? Haha! Anyway, the bowl of Malacca Cendol was amazingly rich in taste and flavors. It had a separate serving of cendol, a screwpine flavor infused green pea flour made delicacy. The finely shaved ice combined with the creaminess of the thick coconut milk and palm sugar sweetness was heaven, except it could be rather sweet for some health conscious consumers. Hidden within the “ice mountain” were some combinations of sweetened azuki and kidney beans. Overall, I felt that the dessert was over rated in term of pricing. Maybe this dessert was sold at a commercialized tourist spot area but that does not mean that it should be charged at such an exaggerated pricing, worst still in a non air-conditioned and posh premises? A bowl of Malacca Cendol would cost almost twice the price of a decent bowl of the Penang Cendol (RM2.00-RM2.50 at roadside stalls). Moreover, what made me curious was the separate serving of cendol in a mini plastic sauce container. Are they trying to control the amount served by charging more for extra orders? You won’t get such a practice in Penang at all as you can always request for some reasonable amount added in without extra charges. On top of that, the cendol here lacked the firm texture. They were too soft to my liking as I would presume that the amount of lye water (sodium hydroxide – NaOH) added was not adjustable to the al dente bites that they should have. An extra charge of RM0.50 would be imposed for each takeaway in a plastic container. Regardless the comparison of pricing, I personally still prefer the ones served in Penang. Other famous outlets with super crazy long queues would be at Jonker 88 and QQ Ice further down the road. If you are coming from Jalan Kubu entrance into Jonker Walk, you will see the Tamil Methodist Church on your left. Walk into the road next to the church (Jalan Tokong) until you see a “Y” junction (JalanTukang Emas/Jalan Hang Jebat). There’s a stage with an arch “Welcome to Jonker Walk” on your right. 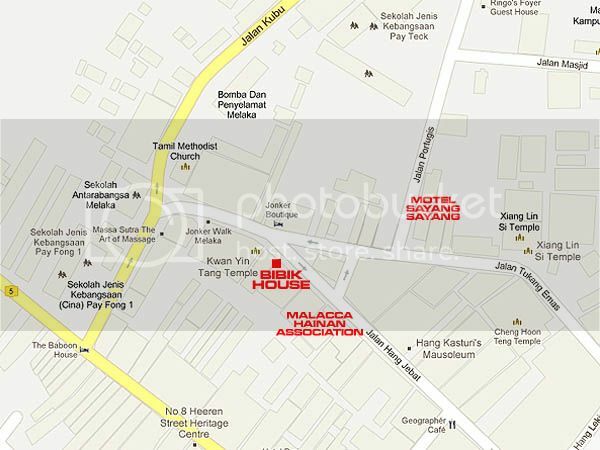 Walk into Jalan Hang Jebat (Jonker Walk) and you’ll see Bibik House on your right. Address: 129 Jalan Hang Jebat, 75200 Melaka, Malaysia.